This past week brought a spate of poor numbers, highlighted by the decline of -0.3 in the April LEI, only the second decline in 2 years. Housing permits and starts declined, as did existing home sales. Industrial production and capacity utilization also were flat or declined. The Empire State and Philly regional manufacturing reports were also substantially weaker (although both still showed expansion). Oil finished above $99 a barrel on Friday. It still remains slightly above 4% of GDP. Gas at the pump leveled off for the third week at $3.96 a gallon. 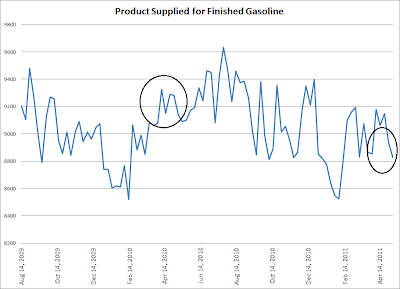 Gasoline usage at 9048 M gallons was 0.5% lower than last year's 9092. This YoY comparison has been negative for the last ten weeks in a row, but this week was relatively speaking the best comparison in close to two months. The BLS reported that Initial jobless claims last week were 409,000. The four week average is now 439, 000. This is the highest 4 week average in half a year, although I expect it to abate in two weeks when the 478,000 weekly number rotates out of the average. Railfax was up 3.6% YoY. The Baseline traffic 4 week moving average is up 1.07% from a year ago. Cyclical traffic is up 3.55%. Intermodal traffic (a proxy for imports and exports) is 5.11% compared with a year ago. On a 4 week moving average basis, YoY traffic percentage growth is at its low ebb for the last year. On a weekly basis, carloads are up 16,200 or up 2.2%, almost all of it intermodal traffic. The American Staffing Association Index rose to 94, its second straight week of advancing after 12 weeks at the 90-92 levels. 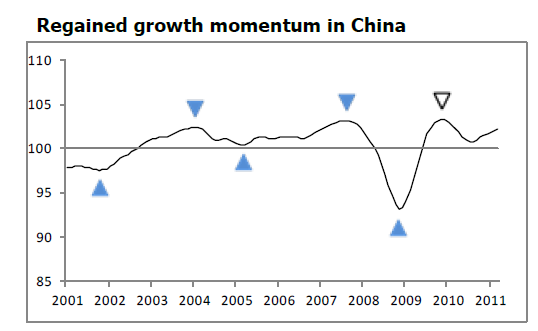 This advance is much like 2007 - slow growth, but not stalled. The ICSC reported that same store sales for the week of May 14 increased 3.2% YoY, but declined -2.0% week over week. Shoppertrak reported a 8.3% YoY increase for the week ending May 14, and a WoW decrease of 6.8%, reversing last week's pre Mother's day gain. Weekly retail sales numbers have been a bright spot all year, generally showing the consumer not rolling over due to gas prices. Weekly BAA commercial bond rates increased .01% to 5.83%. This yields of 10 year treasury bond, to the contrary, decreased 0.4% to 3.20%. There is a tinge of fear of deflation in the treasuries, and the slight increase in commercial rates is the first hint of any relative distress in the corporate market. Adjusting +1.07% due to the 2011 tax compromise, the Daily Treasury Statement showed that for the first 14 days of May 2011, $98.2 B was collected vs. $95.1 B a year ago, for an increase of $3.1 B YoY. For the last 20 days, $130.4 B was collected vs. $127.0 B a year ago, for an increase of $3.4 B, or 2.7%. Use this series with extra caution because the adjustment for the withholding tax compromise is only a best guess, and may be significantly incorrect. Nevertheless the YoY gains have been very tepid in the last month. M1 was down 0.1% w/w, up 1.7% M/M, and up 12.2% YoY, so Real M1 is up 9.1%. M2 was down 0.1% w/w, up 0.7% M/M and up 5.0% YoY, so Real M2 is up 1.9%. Although Real M1 is still strongly in the "green zone" where it has been since before the end of the "great recession," Real M2 has faded back into the "yellow zone" below 2.5%. This week's data continued to show YoY weakness in most data. The slowdown is here. The price of Oil and the amount of fiscal fiscal constriction will determine the severity and length of the weakness. The information reviewed at the April 26–27 meeting indicated, on balance, that economic activity expanded at a moderate pace in recent months, and labor market conditions continued to improve gradually. Headline consumer price inflation was boosted by large increases in food and energy prices, but measures of underlying inflation were still subdued and longer-run inflation expectations remained stable. Private nonfarm payroll employment increased again in March, and the gains in hiring for the first quarter as a whole were somewhat above the pace seen in the fourth quarter. A number of indicators of job openings and hiring plans improved in February and March. Although initial claims for unemployment insurance were flat, on net, from early March through the middle of April, they remained lower than earlier in the year. The unemployment rate edged down further to 8.8 percent in March, while the labor force participation rate was unchanged. However, both long-duration unemployment and the share of workers employed part time for economic reasons were still very high. Industrial production in the manufacturing sector expanded at a robust pace in February and March. The manufacturing capacity utilization rate moved up further, though it continued to be a good bit lower than its longer-run average. Most forward-looking indicators of industrial activity, such as the new orders indexes in the national and regional manufacturing surveys, remained at levels consistent with solid gains in production in the near term. However, motor vehicle assemblies were expected to step down in the second quarter from their level in March, reflecting emerging shortages of specialized components imported from Japan. The rise in consumer spending appeared to have slowed to a moderate rate in the first quarter from the stronger pace posted in the fourth quarter of last year. Total real personal consumption expenditures picked up in February after being about unchanged in January. Nominal retail sales, excluding purchases at motor vehicles and parts outlets, posted a sizable gain in March, but sales of new light motor vehicles declined somewhat. Real disposable income edged down in February following an increase in January that reflected the temporary reduction in payroll taxes. In addition, consumer sentiment declined noticeably in March and remained relatively downbeat in early April. Activity in the housing market remained very weak, as the large overhang of foreclosed and distressed properties continued to restrain new construction. Starts and permits of new single-family homes inched down, on net, in February and March, and they have been essentially flat since around the middle of last year. Demand for housing also continued to be depressed. Sales of new and existing homes moved lower, on net, in February and March, while measures of home prices slid further in February. Real business investment in equipment and software (E&S) appeared to have increased more robustly in the first quarter than in the fourth quarter of last year. Nominal shipments of nondefense capital goods rose in February and March, and businesses' purchases of new vehicles trended higher. New orders of nondefense capital goods continued to run ahead of shipments in February and March, and this expanding backlog of unfilled orders pointed to further increases in shipments in subsequent months. In addition, survey measures of business conditions and sentiment in recent months were consistent with continued robust gains in E&S spending. In contrast, business outlays for nonresidential construction remained extremely weak in February, restrained by high vacancy rates, low prices for office and commercial properties, and tight credit conditions for commercial real estate lending. Real nonfarm inventory investment appeared to have moved up to a moderate pace in the first quarter after slowing sharply in the preceding quarter. Motor vehicle inventories were drawn down more slowly in the first quarter than in the fourth quarter, while data through February suggested that the pace of stockbuilding outside of motor vehicles had picked up a bit. Book-value inventory-to-sales ratios in February were in line with their pre-recession norms, and survey data in March provided little evidence that businesses perceived that their inventories were too high. The available data on government spending indicated that real federal purchases fell in the first quarter, led by a reduction in defense outlays. Real expenditures by state and local governments also appeared to have declined, as outlays for construction projects decreased further in February to a level well below that in the fourth quarter, and state and local employment continued to contract in March. The U.S. international trade deficit narrowed slightly in February after widening sharply in January. Following a solid increase in January, exports fell back some in February, with declines widespread across categories. Imports also declined in February after posting large gains in January. On average, the trade deficit in January and February was wider than in the fourth quarter. Overall U.S. consumer price inflation moved up further in February and March, as increases in the prices of energy and food commodities continued to be passed through to the retail level. More recently, survey data through the middle of April pointed to additional increases in retail gasoline prices, while increases in the prices of food commodities appeared to have moderated somewhat. Excluding food and energy, core consumer price inflation remained relatively subdued. Although core consumer price inflation over the first three months of the year stepped up somewhat, the 12-month change in the core consumer price index through March was essentially the same as it was a year earlier. Near-term inflation expectations from the Thomson Reuters/University of Michigan Surveys of Consumers remained elevated in early April. But longer-term inflation expectations moved down in early April--reversing their uptick in March--and stayed within the range that has prevailed over the past several years. Available measures of labor compensation suggested that wage increases continued to be restrained by the presence of a large margin of slack in the labor market. Average hourly earnings for all employees were flat in March, and their average rate of increase over the preceding 12 months remained low. The pace of recovery abroad appeared to have strengthened earlier this year, but the disaster in Japan raised uncertainties about foreign activity in the near term. In the euro area, production expanded at a solid pace, though indicators of consumer spending weakened. While measures of economic activity in Germany posted strong gains, economic conditions in Greece and Portugal deteriorated further. The damage caused by the earthquake and tsunami in Japan appeared to be sharply curtailing Japanese economic activity and posed concerns about disruptions to supply chains and production in other economies. 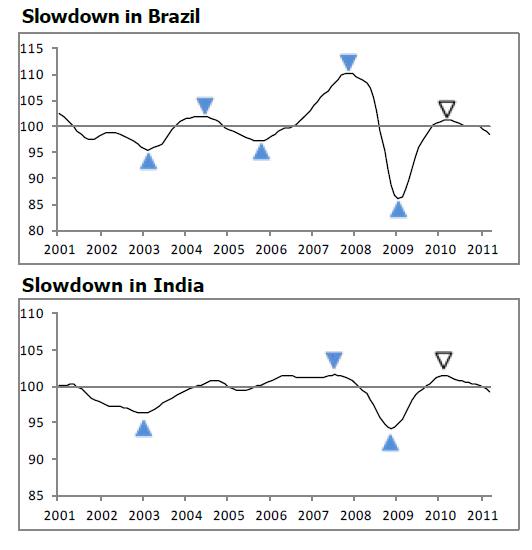 Emerging market economies (EMEs) continued to expand rapidly. Rising prices of oil and other commodities boosted inflation in foreign economies. However, core inflation remained subdued in most of the advanced foreign economies, and inflation in the EMEs seemed to have declined as food price inflation slowed. After reading a large amount of data, there appear to be two economic issues domestically that are indicators of the slowdown. 1.) Manufacturing. We're seeing one month slowdown readings from a variety of regional Fed indexes. We've seen weaker readings from Dallas, Richmond and Kansas City. This month, we've seen drops in Philadelphia and New York's readings. These readings are confirmed by the latest industrial production number from the Federal Reserve, which took a big hit from auto production decreases caused by Japan's earthquake. 2.) Initial unemployment claims: these spiked to very uncomfortable levels over the last few weeks, but have since dropped back to just over 400,000. We've heard continually that the increase was caused by one-time, seasonal factors. The latest drop adds some credibility to these thesis, but we're still not out of the woods. I mention these points, because the latest leading indicators dropped by .3, with the drop caused by lower readings from a majority of the sectors. Right now the incoming date continues to be mixed; the caution flag is still waving. The dollar may be in a position for a technical rebound. Last week there was very little action lower, with prices instead moving in a rounding pattern. There has been a large volume spike over the last week, which may be the sign of a selling climax. Also note the gap higher today and the very strong candle print. There was a strong fundamental reason for the change of direction: dovish statements from the ECB regarding interest rates. I'm suspecting that some of today's action was also some short covering. The idea of a rebound trade does not mean that the fundamental downward trend that is in place is in any danger of being broken. Prices have still moved through important long-term support levels indicating a strong move lower is already taking place. What is happening is a simple "profit taking" of the shorts. Given the underlying interest rate and fundamental issues underlying each currency, I don't see any reason to the dollar is in danger of a strong rally at this point. But, if you're shorting the market, I would consider taking some profits off the table right now. Then blogger went down, so I didn't post anything last week. Let's take a look at the chart to see what has transpired since then. Basically, I felt the chart indicated we would see a technical trade with the dollar bouncing higher, but little change to the overall, underlying trend. So far, that is what has happened. The dollar caught a safety bid as concern over the EU situation made the dollar a more attractive asset. Prices have bounced up and hit resistance at the 50 day EMA and have moved a touch lower since. The EMAs are sending the following signal. The shorter EMAs (the 10 and 20) are moving higher and the 10 has moved through the 20. Also note the 50 day EMA is now moving sideways. There is a fair chance we will see one of the shorter EMAs cross the 50 over the next few weeks. These are preliminary signals of a change, but one that is not confirmed yet. The longer trend is still lower; the recent bump is (so far) a blip in the longer trend. There are so many economic data releases, and they're all a bit noisy, so you can see good or bad news if you want. Still I think a reasonable distillation of it all is that even if the light at the end of the tunnel is just around the corner - though it may not be - it's a long goddamn tunnel. The unemployment rate is too damn high. My biggest concern is that jobs and real household income will not even make it back to their pre-great-recession levels before the next one hits. P.S. : Of course, Bonddad let the cat out of the bag this morning. We're really just econo-dorks. We originally posted this last Thursday. But then blogger went down and we lost the post. As such, we're reposting this because there are some people who both NDD and I feel should be getting a wider readership and we would like to do our part to get it to them. I don't think I've ever done this -- write a blog about what blogs we read on a regular basis. But I read a ton (which is one of the reasons I became a lawyer) so it seems appropriate to mention the blogs/analysts whose work I read on a regular basis as a grand hat tip. Economists View: Professor Thoma posts a large amount of very thought provoking information on all things economic. More importantly, he does not post a few paragraphs, instead adding longer pieces that provide a fair amount of substance to a topic. I should also add he has been very helpful in making recommendations about economic books to read on certain areas. DeLong: First -- he's a prolific writer, so there is almost always something of interest. But most importantly, he's one of the few economic writers who has actually read most economic thought (Say, Keynes, Mill etc..). In other words, he is pretty much the only person on the web who understands most of the arguments been advanced by all sides. At minimum this provides a great service to the web, but it also goes to show that there is a dearth of this type of understanding within the economics community. Finally -- fs there a topic that Brad DeLong does not know something about? Carpe Diem: Dr. Perry posts some very pertinent fact based information regarding the economy. Ever the optimist, it's frankly good to have someone on the web who does see the good news that is around us (and yes, there is some). I should add -- there are times when he zooms into zombie like political commentary which I skip over. 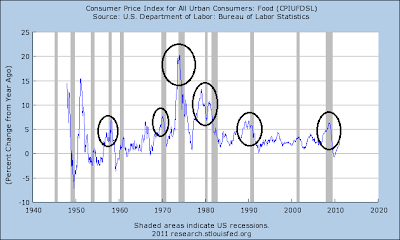 Tim Duy's Fed Watch: I first learned about this site from Mark Thoma's site. Duy provides some great insight into what the Fed's public statements indicate about its internal thinking process. This is very informative, as I simply don't have the time to read all the public statements from the various Fed offices and presidents. Duy's writing is always sharp and very well organized. StreetLight: Kash also posts at Angry Bear. Kash writes some of the best commentary on the web. His writing is lucid; his explanations clear. His recent analysis regarding the strength of US manufacturing was particularly good, although his work in general is top notch. Afraid to Trade: Corey is without a doubt one of the best technical analysts on the web today. He never over plays his hand, but carefully weighs the chart data in a very even handed and fair manner. Additionally, he's a really nice guy who deserves all of his success. Slope of Hope: Tim knight was one of the people (or perhaps the only person) behind the website Prophet.net -- which was literally the best technical website on the web. After he (or they) sold Prophet, he opened up this website. Tim posts charts and very good market analysis, along with individual trade ideas. EconLog: I don't get the Libertarian perspective at all. But these guys explain it well. Their writing is clear and concise, beautifully organized and well-presented. Sites to avoid: anything political that tries to write on economics. Just as an example from both sides of the aisle; the idiots at Powerline still argue that Thomas Sowell should be awarded a Presidential medal -- even though Sowell still argues for the application of Say's law despite this little event called the Great Depression making that argument more than moot. Daily Kos is dominated by the perma bear mentality which has completely missed the successful rebound of US manufacturing (which has accounted for about half of the growth during this recovery) and the recovery in its entirely. Russ Winter is a another data hound, who has written some very good articles on China over the last about 6 months. He went behind a data wall a little bit ago, but has (thankfully) re-emerged. A Dash of Insight -- run by Jeff Miller -- is another great site. First -- we thought we were the nerdiest blog on the net. Miller is very data driven and does a remarkable job of stripping out personal and political bias in his analysis. He is also very even-handed as he goes through the data, presenting a remarkable fresh view of the economy and the markets. Expect these effects to continue through as least the end of the second quarter, and probably well into the third. The 5-minute page shows the drop, the rally along a slightly upward trend line and then yesterday's move through the trend. Yesterday I mentioned that I am now a bit cautious on commodities. The reason is there is now evidence that some of the faster growing economics (Brazil and India) are slowing down. China's inflation rate is now higher than desired, indicating the PBOC will continue raising rates. And gas demand in the US is dropping as a result of lower prices. At the same time, we're not crashing, just slowing. While the US economy printed a slow 1Q, there are no signs of a double dip. As such, I still see a very tight supply/demand situation. Right now, I have no read on the oil market and would avoid it; there are simply too many wildcards in the mix currently. Let's take a look at the current daily chart to see if new information is available. The chart shows the very sharp drop-off, but also shows a consolidation pattern. There is support in the 96-97 area. There is also a possible triangle consolidation pattern emerging. But I'm personally no comfortable with that analysis, thinking a sideways, rectangle consolidation with a top at the 104 handle is possible. In addition, the EMAs are printing a bearish picture: all are moving lower and the shorter are below the longer. For now, I think this takes the wind out of a consolidating triangle with prices moving higher argument. Manufacturing has been a very bright spot for the economy during this recovery. However, it has largely gone unnoticed for two reasons. The political left is wedded to the idea that "US manufacturing is dead" while the political right doesn't want to point out any success story in the economy. Yet, here we are, with manufacturing doing very well. With yesterday's releases of housing permits and starts, and industrial production and capacity utilization (all of which came in negative, defying positive expectations), now is a good time to take an overall view of growth in goods and services production and consumption. It is difficult to say the least to have a high-flying recovery with such an important component of expansion completely missing. And that doesn't even count the Austerian stupidity that is requiring even more cutbacks in government spending at both the federal and state levels. (Reminder: almost half of construction workers are unemployed, we need several $Trillions of work done to efficiency-producing infrastructure, we can borrow at the lowest interest rates in our lifetimes to fund it, and there is not the slightest interest in Versailles in doing so). Tomorrow (hopefully) I'll update the states' fiscal pictures. The US consumer is facing several headwinds: a weak employment market and high gas and food prices. 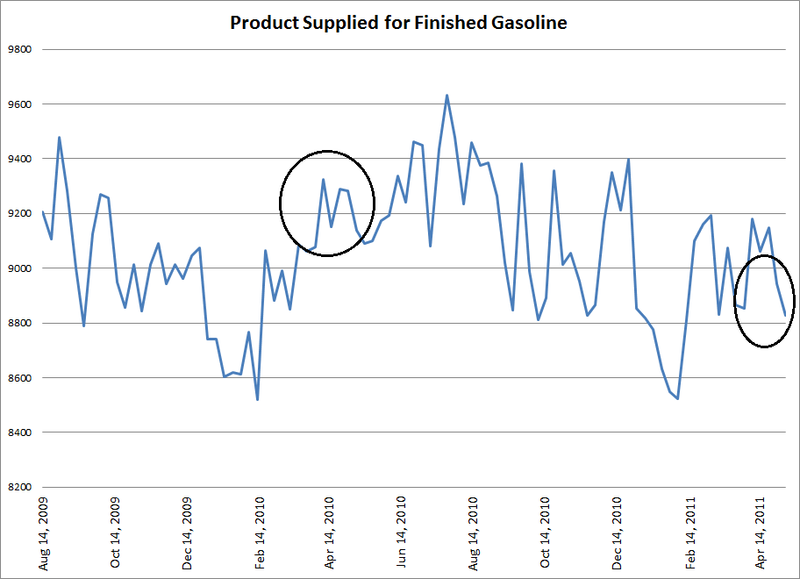 The chart above indicates that consumer demand for gas is dropping at fairly strong rates, especially considering the importance of gas to the economy. Food and beverage purchases increased 1.2% and gas purchases increased 2.7%. 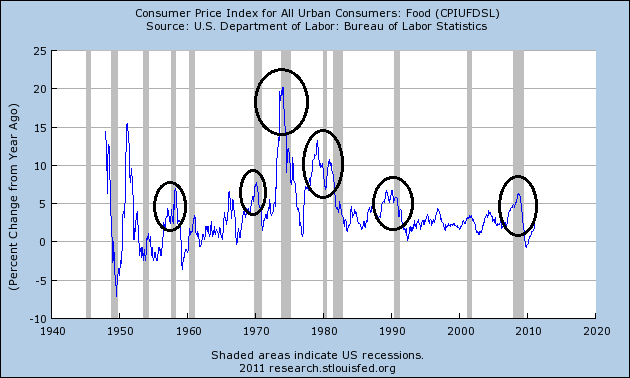 Remember these figures are not inflation adjusted, so the increase also reflects higher prices. 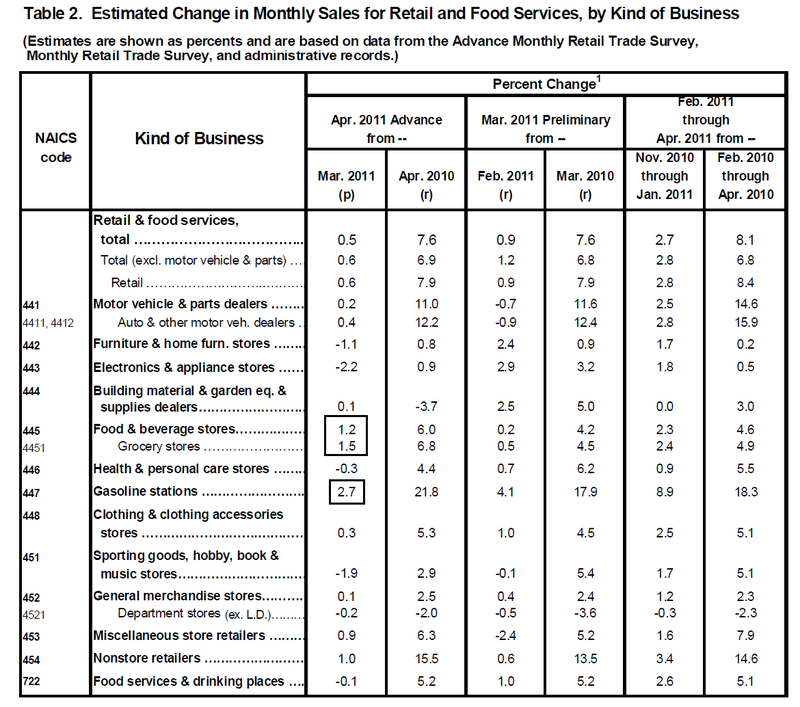 But also note the decreases in other, non-essential categories: furniture is down 1.1%, electronics are down 2.2%, sporting goods are down 1.9% and clothing is only up .3%. 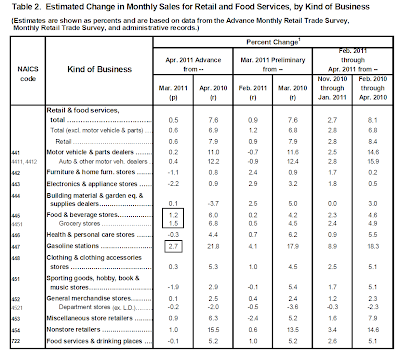 Also note that the percent gains for the same non-food and gas categories in the preceding month are strong, indicating that gas prices are just now starting to bite consumer spending. With gas prices still high and food prices also increasing, the consumer will continue to feel the pinch and adjust his behavior accordingly. This is in addition to a very weak employment market, which, according to the weekly initial claims, is getting worse, not better. Today, I'm going to focus on copper. Copper is usually considered a leading indicator, because it's used in more or less everything made in the economy. On the one year chart, notice that prices have moved through the long, upward sloping trend line established in early June of last year. Prices and EMAs are also bearishly aligned, with the shorter EMAs all moving lower and the shorter EMAs below the longer EMAs. Prices are right below the 200 day EMA, the line between bull and bear markets. The six month chart shows a measured, down up down pattern -- that is, prices moved lower, rebounded, and then moved lower by about the same amount again. The latest move shows a more aggressive move lower, especially recently. Also note that prices are now using the 10 day EMA as technical resistance rather than support. The trend break on the longer term chart is especially reveling about the market direction. The trend was in place move nearly a year, meaning it was very important to the market. Prices are also below the 200 day EMA -- a bearish development. Finally, as I demonstrated yesterday, international markets are slowing. These are the same markets that are a primary reason for the large increase in raw material prices over the last few years. As these markets slow, demand will as well. Municipal bonds hit a positive milestone Monday, with yields on some bonds retreating to levels not seen since the market began selling off sharply in November. Yields for a benchmark of triple-A 10-year municipal bonds fell to 2.62% on Monday, according to Thomson Reuters Municipal Market Data, their lowest level since Nov. 10, around the time the selloff began. Yields move opposite to price. The rally in municipal bonds has been a welcome one for the $2.9 trillion market. As investor confidence in municipal bonds fell, mutual funds focusing on municipal bonds have seen 26 consecutive weeks of outflows totaling $35 billion, according to Lipper FMI, a unit of Thomson Reuters. But as muni-bond indexes have been flat or higher for 24 consecutive trading days, back to April 12, net withdrawals declined to $95 million last week, according to Lipper, the smallest single-week outflow recorded in the past six months. At the same time, key derivatives indexes that track the cost of insuring municipal bonds have improved. The rally hasn't aided longer-term 30-year muni bonds as much as shorter-dated bonds. Yields on 30-year bonds stood at 4.36% Monday, according to MMD, down from 4.85% in April and a peak this year of 5.08% in January. But it is still above the levels of early November. That could pose continued problems for states and municipalities seeking to fund longer-term projects. The Empire State Manufacturing Survey indicates that conditions for New York manufacturers improved in May, but at a slower pace than in April. The general business conditions index fell ten points to 11.9. The new orders index declined five points to 17.2, and the shipments index slipped three points to 25.8. The inventories index climbed to 10.8, its highest level in a year. The prices paid index rose to 69.9, its highest level since mid-2008, while the prices received index held firm at 28.0. Future indexes continued to convey a high level of optimism about the six-month outlook, although prices are widely expected to rise. 70 percent of respondents reporting price increases, and none reporting price declines. This index has moved up a cumulative fifty points over the past six months. The prices received index, at 28.0, was one point higher than in April; its rise over the past six months has paralleled the upward trend in the prices paid index. The index for number of employees inched up to 24.7, indicating that employment levels expanded over the month, and the average workweek index rose thirteen points to 23.7, a multi-year high. Last month we saw three regional manufacturing indexes drop, so this month's data is especially important. While this number is still positive, it did drop. In addition, the prices paid number is extremely high, indicating this is an issue. Higher input prices may put downward pressure on hiring plans. However, the optimism index is also very high, telling us that owners think the current issues are not altogether damaging to the longer picture. About a year and a half ago (on August 31, 2009), I published an article titled The Fits and Starts Expansion. where I identified the following areas as economic drivers: consumer spending (albeit at a slower pace than the previous expansion), inventory adjustments, manufacturing, Asian consumers and stimulus spending. First, I should note that all these areas did contribute to the latest expansion in more than insignificant ways. However, we are now entering a different phase where a slower pace of growth is occurring. India has been raising rates for over a year and China has started to raise rates. In addition, China is also raising reserve requirements to add further weight to the slowdown. The Indian market is actually in downtrend, with prices fluctuating above and below the 200 day EMA since the first of the year. The Chinese ETF is using the 200 day EMA for technical support, with prices not having made a new high since late last year. The Brazilian ETF has been moving more or less sideways since late last year. With three of the four largest growing economies slowing, the US won't be far behind. As I mentioned above, I would be long in this market, at the levels stated above. However, I would have very tight stops. Remember, on the flip side of bond prices are bond yields. At some point, yields get to low to justify the risk taken. Currently, the 10-year is yielding 3.17%. Eyeballing the situation, I would use 2.75% as the abject lowest the 10-year should yield in the current environment. In addition, I wouldn't be looking for massive gains from this trade, instead, thinking that a few points would probably be the pretty good. Last week, the bond market was caught between several interesting cross currents. Despite the coming issue of the debt ceiling -- which should be bond negative -- bonds actually held steady. The reason is they are still considered a safety bid, which they caught as the risk trade (commodities) went off. In addition, concern about the EU situation contributed to the bid as well, as has weakness in the stock market. The IEFs consolidated last week, eventually hitting the 10 day EMA and are now moving higher. The shorter EMAs are bullishly aligned (shorter above longer and all moving higher) and prices are using the EMAs as technical support. The A/D and CMF lines indicate money is moving into the market and the MACD is still giving a buy signal. The TLT are in the same technical position as the IEFs, but with the exception of a slightly weaker price and MACD position. Something I will start delving into in more detail is sector analysis -- that is, breaking the various markets down into smaller components to see what those sectors tell us about the overall markets. However, the financial sector of the market (ETF: XLF) may be telling us a weaker market lies ahead. Financial stocks have been an interesting sector to watch as of late. For a while it was the sector to watch from 2008-2010, if financial stocks went up the market followed, Bob Paisini loved to mention the correlation. Now it seems financials are either being looked over by the market, when it can be giving a huge early warning sign that a downward movement is on the horizon. Financials have been slowly declining throughout the last month or two, even as the market rallied. Our post on GS mentioned to watch the key $148 level, after breaking that GS fell to $141. There was a similar support level on XLF that was broken on Friday. XLF closed below $15.87 a key support level. The support level was created in December after XLF broke out and started an uptrend to new highs. It was then a support twice during XLF's decline, providing a launch pad for the ETF. But the third time this support level failed and XLF closed at $15.77. In addition to this being a support level, the support level makes up the base of a descending triangle pattern. This is a 1.14 measured triangle and this move would put XLF around 14.77ish. Raising the Federal debt ceiling should be a political non-event, supported by the vast majority of politicians with a few vetoes for good political measure. Instead, we are treated to a veritable circus of political stupidity and posturing, with people who have absolutely no idea what constitutes an economy arguing about the debt ceiling. 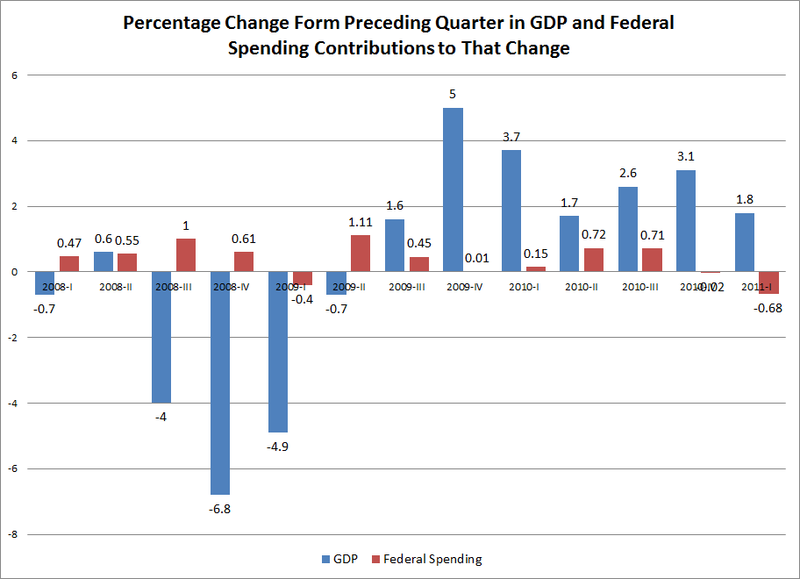 As readers of this blog know, government spending is part of the GDP equation. According to the CBO, government spending accounts for a little over 20% of GDP and has for the last 40 years. Therefore, a cut in spending is by definition a cut in GDP. But there is a deeper issue involved here, one that is regrettably difficult to quantify but one that nonetheless exists. That is uncertainty. For the last few months, we've been hearing about how Washington can't agree on either a budget or whether or not to raise the debt ceiling. The first spending issue occurred a little over a month ago as the Republicans and Democrats wrestled about whether or not to cut somewhere between $30 and $60 billion for the current years budget. The amount is unimportant; what is important is that there was extreme disagreement over a paltry amount of spending. This episode sent the entirely wrong message to the economy and the financial markets: namely, that American government barely works and may not be able to resolve the budget issue. This is without a doubt an extremely scary proposition. The U.S. is still the world's largest economy and there are important budget issues that must be resolved. The fact we're debating with such animosity about such insignificant amounts of federal spending right now indicates the bigger issue of balancing the budget may not even be possible. That is enough to halt any proposed plans. 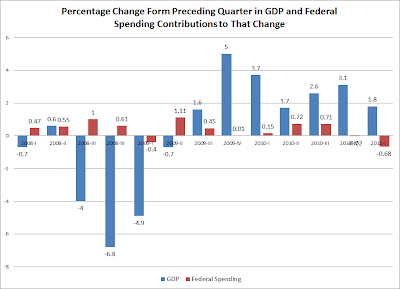 In the above chart, notice that in the last two quarters, the austerity issues at the federal level have clearly subtracted from overall growth. This again returns to the importance of understanding that government spending is variable in the GDP equation. The debt ceiling debate is perhaps more important. That fact we're even having the debate -- or even saying shutting down the government is a good idea -- is the height of abject stupidity. To understand the sheer magnitude of the incomprehensible idiocy behind this, it's necessary to understand the importance of the government debt market. The Treasury Yield curve is the base yield curve of the US economy. All other bonds are quoted based on their respective spread to treasuries. For example, a trading desk would quote a specific corporate credit at +50 to the corresponding Treasury, meaning the bond was trading at 50 basis points more than the corresponding Treasury. Treasury bonds are also used to hedge mortgages and corporate bond issues. First, US government debt plays a special role in the financial system: T-bills are the universal safe asset, the ultimate collateral. That’s why, during moments of financial stress, the interest rate on T-bills has actually gone negative. Make that safe asset suddenly unsafe, and it might cause vast disruption. 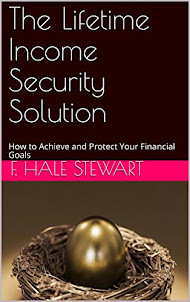 These assets have to remain safe given their incredible importance to the US financial system. In short, arguing about the debt ceiling creates a tremendous amount of uncertainty, which slows private action. And that is something we don't need, especially as the economy is faced with a slowdown scenario. A more sophisticated measure of the level of financial fear is the "TED spread." The TED spread is defined as "the difference between the three-month T-bill interest rate and three-month LIBOR." If you don't want to accept my word for it, then here is a link to Prof. Krugman's explanation right after the Bear Sterns collapse in March of that year. Remember the TED spread? It closed at 139bp on March 17, which was a decided improvement over the levels over 400bp we saw last fall, but was still pretty wide. On Friday it closed at 24. This is true even though there is widespread agreement that Ireland would be better off repudiating its debt, Greece must restructure its debt, and rumors that Greece could leave the Euro. Indeed this is a very different environment than even a year ago. First -- it's good to be back. As you know by now, blogger went down at the end of last week. It's amazing -- and a bit scary -- how omnipresent Google has become. That being said, here is what I wrote about the markets last week. I am still very concerned about the fundamental situation. As NDD has pointed out in his weekly high-frequency posts, most of these indicators are slowing. While the latest employment report was surprisingly positive, the spike in new claims is concerning. With the austerity movement taking hold in Washington, the "G" part of GDP is going to be weak for at least one more quarter. Although commodities moved lower last week, their overall prices are still high. In short, I don't see any strong fundamental reason for the markets to move higher right now. I have no reason to alter my opinion at this time. As I will write throughout the week, it appears the economy is most likely moving into a soft patch which will remove upward momentum from the market. Important foreign markets (China, India and Brazil) are experiencing higher than desired inflation which is leading their respective central banks to raise rates. Gas is nearing $4 gallon which is dampening consumers and the federal fiscal situation is chaotic creating a tremendous amount of uncertainty decision markets. As such, there is little fundamental reason for markets to move higher. The 10-day, 5-minute chart shows that prices have been consolidating in about a two-point range (between roughly 133.6 and 135.6) for the last 8 days. Notice that all strong advances are followed by consolidation lower. The daily chart shows prices consolidating around the 134 level, which has operated as a center of gravity for trading for the last few weeks. Also note the 10 day EMA is now moving sideways and the 20 day EMA's advance is weakening. The 50 day EMA is still moving higher, indicating the longer-term trend is still up. The technicals are weakening. The A/D line has moved lower as has the CMF while the MACD is dropping (indicating weaker momentum) and has given a sell signal. While the transports have advanced to a new high, the chart appears to be forming a double top. Prices have recently moved through the 20 day EMA in a strong downward bar. The QQQs have been trapped by the 59 price level. After breaking out, the IWMs fell back to the 50 day EMA and are currently consolidating.